On 12 September 2017, the Special Economic Zone Authority in Duqm (SEZAD) concluded its promotional campaign "Invest in Duqm" organized in three Chinese cities: Yinchuan, Dalian and Shanghai. H.E Yahya bin Said Al-Jabri, SEZAD Chair, said that the campaign aimed at introducing the business community in China to the Special Economic Zone in Duqm (SEZD) and its characteristics in terms of strategic location on the international trade route and the incentives and facilities provided by SEZAD to the investors. In a speech at a seminar held in Shanghai, China, Al-Jabri said that SEZD offers promising investment opportunities through a transparent, competitive and sophisticated business environment. He added that in addition to the geographical location of SEZD, SEZAD offers a number of incentives, including tax exemptions of up to 30 years , removal of restrictions on capital movement, exchange of currencies, distribution of profits, existence of one-stop services for corporate registration, issuance of building permits, environmental permits and licenses for practicing activities, and facilitating procedures for issuing work permits for foreign manpower. 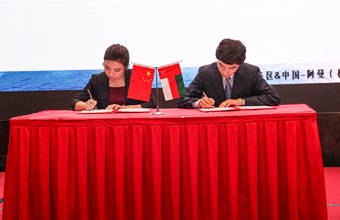 The last day of the campaign witnessed the signing of a memorandum of understanding between Wanfang Oman Company and the Chinese Petrochemical Industries Federation, which provides for the promotion by the Federation of Duqm among Chinese companies working in the petrochemical sector to invest in the SEZD. The Federation enjoys a wide presence in China, which includes many major companies operating in the petrochemical industry. Oman Oil Company (OOC) sought to introduce the business people in Shanghai to its oil storage capabilities and plan to set up an oil storage terminal in Ras Markaz. Said bin Homoud Al-Mawali, General Manager of Oman Tank Terminal Company (OTTC), said in a presentation during which he reviewed the projects carried out by the OOC in SEZD that the Ras Markaz oil storage terminal enjoys a strategic location off the Indian Ocean. He highlighted the project stages. Ras Markaz oil storage terminal is a vital project to store all types of crude oil in large quantities outside the Strait of Hormuz. The terminal is the largest project of its kind in the Middle East. OOC is looking to make the terminal a global hub for crude oil storage. The expected investments of the first stage shall be about 1.7 billion USD with a capacity of about 26 million barrels. Al-Mawali also discussed the project of supplying gas to Duqm to supply gas to the factories that will be established in SEZD. He also highlighted the Duqm Refinery, which will be set up by OOC in cooperation with Kuwait Petroleum International. During the seminar, Reggy Vermeulen, CEO of Duqm Port, stressed the importance of the port as a multi-purpose port with the necessary capabilities to become a pivotal port in the world trade movement. Ali Shah, Chair of Wanfang Oman Company, reviewed the projects to be established by the company, which is supported by the Ningxia Region, stressing that the Sino-Omani Industrial City in Duqm welcomes the investment of Chinese enterprises. In other presentations, Jalal Al-Lawati, Director of Promotion, SEZAD, reviewed SEZAD advantages and the facilities it provides to investors, while Nasr bin Zaher Al-Hadhrami, Promotion and Investment Executive, the Public Authority for Investment Promotion and Export Development "Ithraa" highlighted the elements of investment in the Sultanate. The seminar witnessed extensive discussions on the financing of projects and the possibilities of SEZD to enhance the logistics and services provided by SEZAD to investors. It also touched upon investing in the oil and petrochemical industries, the procedures of Chinese investors obtaining work visas in the Sultanate and the facilities provided in this framework.